We have added a fieldbus interface to the DAQSTATION. In order to take advantage of the multi-channel measurement and trend-display capabilities of the DAQSTATION, we installed multiple analog input (MAI) and multiple analog output (MAO) function blocks. The DAQSTATION thus has become able to deal with a wide range of applications, from large-scale instrumentation using distributed control systems (DCS) to stand-alone small-scale supervisory systems. The DAQSTATION is now capable of easy networking through connection between a fieldbus and Ethernet. This paper describes examples of such applications. 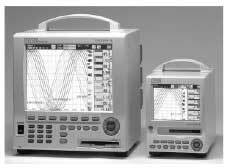 Yokogawa's industrial recorders have been widely used in order to monitor and record data acquired from the field. Concurrently, sensors in the field have been made increasingly intelligent and come to hold not just "data" but "information" of additional value provided by such functions as failure detection and statistical analysis. As a result, recorders are required to serve as media for processing such information and convey it in an easy-to-understand form. 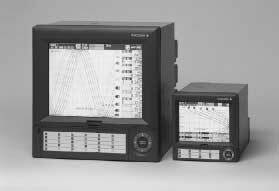 The DX series of DAQSTATION2 released by Yokogawa in 1999 is a type of paperless recorder, a product extensively characterized as a data acquisition station. In order to extend the network capabilities of the DAQSTATION, we remodeled the DX series to support FOUNDATION™3 Fieldbus H1. In August 2000, the DX series became the world's first FOUNDATION™ fieldbus-enabled recorder to be registered with the Fieldbus Foundation in the US. The features of the DX series are described below, and its external view is given in Figure 1. The following product development guidelines were adopted in order to add FOUNDATION™ fieldbus communication capabilities to the DAQSTATION. Propose specific examples of application to users, as the recorder will be the world's first fieldbus-enabled model. Make the utmost use of in-house resources already developed for Yokogawa's family of field instruments. Ensure interoperability with earlier and later systems and field instruments on the fieldbus. Table 1 summarizes the fieldbus specifications of the DAQSTATION. Sends the measured/computed data of the main unit to other devices (one channel for each block). Sends the measured/computed data of the main unit to other devices (eight channels). Receives measured data, for example, from other devices (eight channels) to record/show them in/on the main unit. Controls communication on the fieldbus according to a preset schedule. Power supply through communication lines. Supply current: 16.5 mA max. The standard analog input (AI), multiple analog input (MAI) and multiple analog output (MAO) function blocks prescribed by the FOUNDATION™ fieldbus standard have been installed in the DAQSTATION. 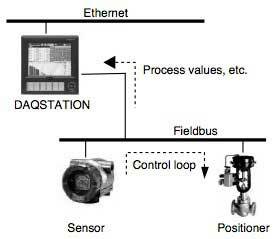 As a result, the station can exchange such data as process values with other devices on the fieldbus. The station can also control communication on the fieldbus using the Link Master (LM) function. A fieldbus tool for the DAQSTATION, PC software for building a fieldbus system using the DAQSTATION as a communication host station, has been made available separately in anticipation of small-scale monitoring applications requiring no large-scale control system, such as a distributed control system (DCS). Figure 2 shows the circuit diagram of the DX series. 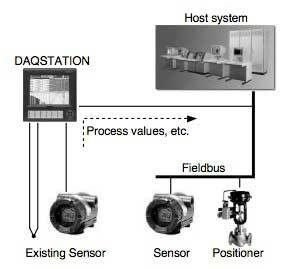 The fieldbus communication functions of the DAQSTATION are installed in a subsystem that is built into the main unit only when the recorder is a fieldbus model. This strategy has made it possible to configure almost all of the functions only on the subsystem side. Consequently, we were able to utilize the in-house resourcesthat were previously developed for our family of field instruments. Functions other than the fieldbus communication functions are implemented on the main system side. 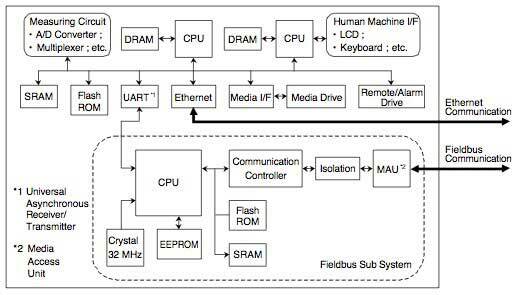 Thus, the subsystem and main system are configured so that they exchange required data via internal serial communication. For details on the main system, we would like the readers to refer to reference1 recited herein. signals have been isolated between the MAU and communication controller. Programs and static parameters are stored in a flash ROM and read out of it as necessary. The SRAM is used as main memory. In addition, nonvolatile parameters, such as communication settings, are stored in an EEPROM as necessary. Figure 3 is a block diagram of software functions. Like the hardware, the software of DAQSTATION is composed of two parts—the main system serving as a recorder responsible for data acquisition and the subsystem responsible for fieldbus communication. This software configuration enables the DAQSTATION to output the analog data of measurement/computation channels being acquired by the main system, through the AI and MAI function blocks, to a maximum of 16 other devices on the fieldbus. 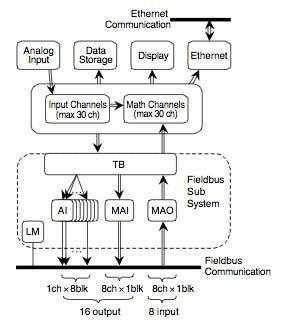 In addition, a maximum of 8 items of analog data acquired by other devices on the fieldbus can be input to the station through the MAO function block. Like regular analog data inputs, these data items can be recorded or displayed through the computation channel. Alternatively, they can be transmitted to a LAN via Ethernet. Although mapping between the measurement/computation channels of the main system and AI, MAI and MAO function blocks is defined by a table within the transducer block (TB), users can make changes to the table. The DAQSTATION is provided with the LM function and, therefore, can also be used as a link active scheduler (LAS) for controlling fieldbus communication. From the standpoint of users and applications, the following three types of application are proposed for fieldbus communication based on the DAQSTATION. Under an operating environment based on a host system, such as a DCS, the DAQSTATION can be used as a converter for signals coming from existing non-fieldbus-standard sensors. Figure 4 shows a schematic example of this application. In the US and European countries, revamped plants (renovated or expanded versions of existing plants) are seen more often than newly built plants. In that case, wiring from existing sensors, including thermocouples, is often attached to such indicating instruments as recorders installed in a central operation room. When building a fieldbus instrumentation system that reuses these facilities, users can use the DAQSTATION as a converter for signals from existing sensors to the fieldbus. Thus, users can work with the station on the host system in an integral manner, while using the station as an indicating instrument as they used to. In this application, the AI and MAI function blocks of the DAQSTATION are used. 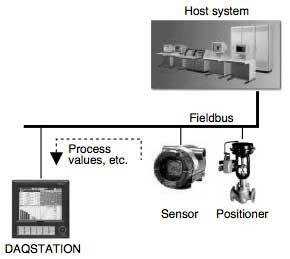 Under an operating environment based on a host system, such as a DCS, the entire range of information is transferred from the field to the operator console of the host system for utilization as the results of fieldbus instrumentation. In contrast, in conventional instrumentation on-site staff members working outside a central operation room where such an operator console is installed has also been provided with such information by means of annunciators and recorders housed in cabinets. Now that the MAO function block has been installed in the DAQSTATION in this new development, the station can be used as a "field indicator" for monitoring process values and other pieces of information in fieldbus instrumentation under the host system based operating environment. Figure 5 shows a schematic example of this application. The FOUNDATION™ fieldbus standard also gives consideration to the autonomous, distributed control of field instruments. Consequently, the fieldbus can be used with field instruments alone, without having to use such large-scale control systems as DCSs. This feature can be taken advantage of by using the DAQSTATION as a supervisory unit. As a result, it is possible to configure a small-scale instrumentation system, e.g., a built-in controller or an environment monitoring system, as a fieldbus system, without using any large-scale control system. Figure 6 shows a schematic example of this application. In this example, the MAO function block is used to monitor and record process values in the field, while the LM function is used to control communication on the fieldbus. The DAQSTATION comes standard with an Ethernet port, enabling users to easily acquire trend graphs or data by having access from PCs in their offices. The DAQSTATION was submitted to the interoperability test of the Fieldbus Foundation before it was released in the market. The station has successfully passed the latest version of the test, Interoperability Test Kit (ITK) 4.0. We have verified interoperability not only with our own host system, the CENTUM, but also with some host systems from other companies. In this article, we have discussed the compliance of the DX series of DAQSTATION with the fieldbus standard. At this point, we report that we have also remodeled the MV series of MobileCorder data loggers (Figure 7), laboratory-use sister products of the above-mentioned series, in order to support FOUNDATION™ Fieldbus H1. The fieldbus-enabled models in the MV series have already been registered with the Fieldbus Foundation. DAQSTATION and MobileCorder are a registered trademark and a trademark of Yokogawa Electric Corporation. FOUNDATION™ is a registered trademark of the Fieldbus Foundation in the US. Other trade names and designations that are referred to in this document are either trademarks or registered trademarks of the respective companies.